A new £6 million business centre, providing affordable accommodation for new or small to medium sized businesses, will be officially opened on Thursday 7 June at 4pm. 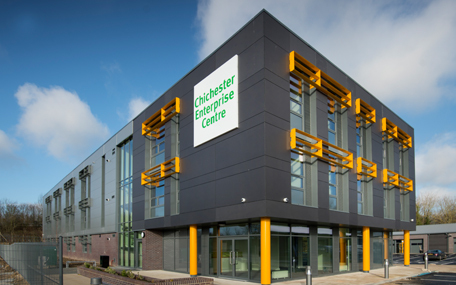 The Enterprise Centre, located in Terminus Road Chichester, has been built by Chichester District Council in order to create jobs and encourage the growth of start-up, small and medium sized businesses in the district. Gillian Keegan, MP for Chichester, will officially open the centre and will meet the 23 businesses that have already located into the Enterprise Centre and are benefitting from the support it provides. The centre provides 3,282 square metres of high quality workspace, including serviced and managed offices, workshops and shared workspace in a purpose-built development. The centre offers flexible business accommodation, with a range of options available, from renting a desk for an hour, through to permanent office space. The centre can even offer a business address for new businesses that are trying to get up and running. Basepoint was chosen by Chichester District Council to manage the centre. "We have already developed a great partnership with Basepoint, who are managing the centre on our behalf. They have a huge amount of experience in managing these types of development and have already received a great response from the local business community. "I am looking forward to meeting with the new businesses that have already moved into the centre, when it is officially opened on 7 June." "At Basepoint we are focused on developing thriving business communities through our UK network of high-quality enterprise hubs. Flexible workspace is crucial for growing businesses, and at Chichester Enterprise Centre members will be able to rent desks by the hour or take permanent offices. "From individual entrepreneurs starting out, to burgeoning SMEs, we are here to help facilitate growth."